The approach to the patient with intractable bladder hemorrhage is fairly standard and begins with a thorough evaluation to determine its cause. Information obtained on history (e.g., prior malignancy, prior radiotherapy, prior cyclophosphamide, etc.) may suggest the etiology; however, multiple factors maybe involved and assumptions should not be made. 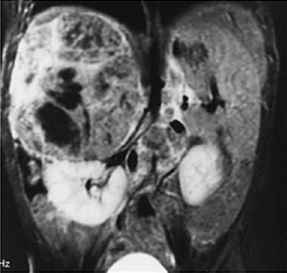 Outside of the acute setting, all cases in which the etiology has not been identified require a formal hematuria workup, including cystoscopy, urine cytology, and upper tract imaging. The chronicity and severity of the hematuria as well as any prior attempts at therapy are important to determine. This may suggest to what degree, if any, the hematuria is refractory to conservative measures. Patients with severe hematuria can develop urinary retention secondary to the accumulation of blood clot within the bladder; therefore, the ability to void should be questioned. A list of the patient's current medications should be reviewed and any anticoagulants discontinued accordingly. The primary goals of physical examination are to determine the hemodynamic stability and overall health status of the patient as well as the presence of urinary retention. Laboratory studies should include a CBC and differential, serum electrolytes, BUN, creatinine, coagulation profile, and urine culture. Initial therapy is directed toward maintaining hemodynamic support through i.v. fluids as well as through blood and blood product replacement as necessary. grading system has been proposed to facilitate treatment in this regard (Table 13.11) (DeVries and Freiha 1990). The first step involves bladder decompression through the insertion of a large-bore urethral catheter for clot evacuation and saline lavage. This is a simple maneuver that may slow or stop the bleeding altogether. Continuous bladder irrigation (CBI) through a three-way Foley catheter is initiated once the effluent is clear or pink-tinged and free of clots. In some instances, bedside lavage is inadequate and formal cysto-scopic clot evacuation in the operating room becomes necessary. During this time, the bladder is carefully inspected for a source of hemorrhage, and biopsies or fulguration of suspicious areas can be performed. Cases not responsive to clot evacuation and fulguration or those with cystoscopic evidence of diffuse hemorrhage require supplementary therapy with systemic or intra-vesical agents. E-aminocaproic acid (Amicar), given orally or par-enterally, inhibits the process of fibrinolysis by preventing the activation of plasminogen to plasmin. It is used commonly in the field of cardiothoracic surgery based on demonstrated efficacy in the reduction of postoperative hemorrhage (Trinh-Duc et al. 1992). Unfortunately, there have been no comparative trials evaluating the efficacy of this agent in the context of hemorrhagic cystitis. Proponents of its use for bladder hemorrhage cite anecdotal reports of apparent success in addition to the evidence provided by disciplines outside of urology (Aroney et al. 1980; Lakhani et al. 1999; Stefanini et al. 1990). Administration involves a loading dose of 5 g followed by 1 g/h for 8 h or until bleeding stops. The maximum recommended dosage in 24 h is 30 g. As an inhibitor of fibrinolysis, E-aminocaproic acid promotes clot formation; therefore, it should be used in conjunction with CBI. Upper tract hemorrhage remains a contraindication to its use since clot formation within the ureter can lead to obstruction and acute renal failure. Sodium pentosan polysulphate (Elmiron), given orally, is a low-molecular-weight heparinoid that replaces deficient glycosaminoglycans on the bladder surface (Parsons et al. 2002). In doing so, it removes potential triggers of hematuria by protecting the bladder wall from bacterial adherence as well as from the absorption of toxic substances within the urine. Such protection may also facilitate healing of the bladder surface. While used more commonly in the treatment of interstitial cystitis, sodium pentosan polysulphate has been shown to resolve hematuria in 50 % of patients with radiation or cyclophosphamide-induced hemor-rhagic cystitis when given as first-line treatment (Parsons et al. 1993; Sandhu et al. 2004). Dosing begins at 100 mg three times daily with a gradual reduction to 100 mg daily as hematuria improves. Treatment may be discontinued when the hematuria resolves completely. At this time, there is no data available regarding the rate or time to recurrence with such therapy. Of the commonly used intravesical agents, alum and prostaglandins have the advantage of not requiring an anesthetic. Alum (aluminium ammonium sulphate or aluminium potassium sulphate) is an astringent that causes protein precipitation, vasoconstriction, and decreased capillary permeability without damaging normal urothelium (Ostroff and Chenault 1982; Arrizaba-laga et al. 1987). Commonly delivered as a 1 % solution (50 g alum in 51 sterile water) via CBI at a rate of 250 ml/ h, alum leads to the complete resolution of hematuria in 60%-100% of hemorrhagic cystitis patients (Ostroff and Chenault 1982; Gattegno et al. 1990; Choong et al. 2000). The median time to resolution of hematuria ranges from 3-4 days, but therapy may be required for as long as 7 days. Up to 20 % of patients will develop recurrent hematuria within 5 - 10 months. The risk of systemic toxicity is low because urothelial permeability to aluminum is minimal and prompt renal excretion ensures elevated aluminum levels are avoided. There are case reports of aluminum encephalopathy with intravesical alum, the majority of which occurred in patients with baseline renal insufficiency (Kavoussi et al. 1986; Shoskes et al. 1992; Perazella et al. 1993). In addition to central nervous system disturbance (lethargy, confusion, seizures), aluminum toxicity can result in metabolic acidosis and coagulopathy. While renal failure is not an absolute contraindication to the use of intravesical alum, it should be used with caution and at a dose that should not exceed 3 g/h (Kennedy et al. 1984). Aluminum levels should be monitored periodically in such patients. Intravesical alum irrigation should be discontinued immediately if serum aluminum levels are elevated or systemic toxicity is suspected. Prostaglandin-E1, -E2, and -F2a, already discussed as a treatment option for cyclophosphamide-induced hemorrhagic cystitis, may prove beneficial in cases arising from a variety of other causes as well. Numerous protocols for prostaglandin administration have been described including: (1) 50 ml of4-10mg/l of car-boprost tromethamine left indwelling for 2 h four times per day alternating with saline CBI and (2) 8-10 mg/l of PGF2a via saline CBI at a rate of 100 ml/h for 10 h (Choong et al. 2000). Both protocols lead to a complete response in 50 % of patients treated over a median period of 6 days (Levine and Jarrard 1993). A small trial comparing intravesical PGF2a and 1 % alum in patients with hemorrhagic cystitis of unknown origin demonstrated similar response rates of 80 % and 90 %, respectively (Praveen et al. 1992). Although there was a complete lack of systemic side effects in both groups, virtually all patients developed transient bladder spasms requiring symptomatic control. Since prostaglandins are very expensive, 1 % alum remains the intravesical agent of first choice. The best known and most effective intravesical hemostatic agent is formalin, the aqueous solution of formaldehyde. When administered intravesically, formalin rapidly fixes the bladder mucosa through a process involving protein cross-linking. This prevents further necrosis and blood loss from occurring (DeVries and Freiha 1990). First introduced in 1969 for the treatment of radiation cystitis, 10 % formalin led to the complete resolution of hematuria in 22 of 24 patients with no serious side effects noted (Brown 1969). Since that time, formalin has also demonstrated success in the treatment of hemorrhagic cystitis. At the same time, the potential for serious toxicity (up to 15 %) with bladder formalinization is well documented. In light of the potential for significant treatment-related morbidity, formal instillation is generally reserved for cases of in tractable bladder hemorrhage refractory to conservative treatment. The results of a meta-analysis evaluating 235 cases of intractable bladder hemorrhage treated with intravesical formalin form the foundation upon which most recommendations are made (Donahue and Frank 1989). Formalin can be administered intravesically in concentrations ranging from 1 %-10% (typically 1 %, 5%, 10%). While there is a trend toward improved results with 10 % formalin, there is no statistical difference in complete response among the three preparations (71%-83%). Hematuria typically resolves within 48 h (1 - 5 days) and the duration of response is 3-4 months, regardless of dose. Major complications (5%-15%) include bladder contracture, ureteral stenosis, acute renal failure, and even death. Although there appears to be a trend toward a higher rate of major complications with higher concentrations offormalin, this has never been proven. Similarly, the rate of minor complications (14% - 78 %), of which irritative voiding symptoms are most common, appear to correlate with dose. Given the lack of comparative studies it is difficult to make firm recommendations regarding the optimal concentration of formalin. There is some suggestion that hematuria secondary to radiation cystitis may require 5 % or more formalin, while hematuria due to cyclophosphamide or bladder cancer may require less than 5% formalin; however, this is merely conjecture. Most centers advocate the initial use of 4% or less formalin since this concentration appears to optimize the treatment response (> 75 %) while minimizing the potential for minor and major complications (Russo 2000). (catheter level at 15 cm above pubic symphysis). Although the optimal contact time is not known, most recommend limiting the treatment session to 15 min (Choong et al. 2000). Approximately 10%-30% of patients with severe hemorrhagic cystitis will not respond to low-dose formalin instillation. A second instillation using highdose formalin (5 % -10 %) remains an option; unfortunately, repeat administration of formalin is associated with a lower complete response rate (50 %) and a higher rate of major complications (40%). Treatment alternatives include hyperbaric oxygen therapy, arteriograph-ic embolization, and urinary diversion with or without cystectomy. Hyperbaric oxygen is most appropriate for refractory radiation cystitis as described above; however, animal studies suggest that it may also be of benefit in cases of cyclophosphamide-induced hemorrhagic cystitis (Hader et al. 1993). Therapeutic embolization of the internal iliac artery to control bladder hemorrhage was first reported in 1974 (Hald and Mygind 1974). Most studies report a response rate in excess of 80 %, usually of immediate onset (McIvor et al. 1982; Rodriguez et al. 2003; Nabi et al. 2003). A common complication of embolization is severe transient gluteal pain caused by claudication of the superior gluteal artery (Choong et al. 2000). Case reports of leg ischemia and bladder necrosis also exist (Woodside et al. 1976; Braf and Koontz 1977). Improvements in both technology and technique have led to su-perselective embolization. With such procedures, the efficacy of embolization is maintained while patient morbidity is reduced (De Berardinis et al. 2005). Embolization is most appropriate for those patients who are refractory to conservative measures, including formalin instillation, but whose health status precludes surgical intervention. Open surgery is an option of last resort to be used only in patients with massive intractable bladder hemorrhage who are otherwise good surgical candidates. Open cystotomy combined with bladder packing and percutaneous urinary diversion, cutaneous ureterosto-my, and cystectomy with urinary diversion have all been described, each with variable outcome (Andriole et al. 1990; Pomer et al. 1983; Okaneya et al. 1993). Unfortunately, many patients with severe hemorrhagic cystitis are elderly and unfit for invasive surgery. It is in situations such as this that intractable bladder hemorrhage becomes a lethal event.